Jean-Claude Carme at Sunrise Yachts tells us that work on the 45m new build motor yacht Project Sunset is well under way, with launch set for 2012. Being built to Lloyds class and MCA compliant, Sunset will accommodate 11 guests in five double staterooms, including a main deck master suite. A sistership to the 45m Africa delivered in 2009, Sunset was also designed by Paolo Scanu and features an interior by Franck Darnet Design in raised panel French oak highlighted with raw silk fabrics and leather. 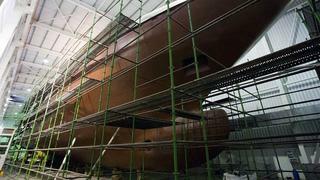 Also currently in build at the yard is a 63m superyacht designed by Espen Oeino with an interior by Redman Whiteley Dixon and scheduled for launch in late 2013. Sunset is currently for sale direct from the yard asking €16.5 million.